Reminder: Noise Pop Culture Club Starts Right Now! All cities contain voids, loopholes, and niche spaces: pockets of unscripted wilderness that can be explored for their creative potential. Join Matthew Passmore, cofounder and principal of Rebar, for a brief overview of Rebar’s work followed by a workshop that invites participants to bring a photograph or description of a niche space from their own environment, whether urban, suburban, or rural. We will collectively brainstorm ways to occupy these niches in ways that fulfil unmet social needs and improve the quality of our shared habitat. This will be a hands-on workshop of drawing, thinking, and discussion. Please Take Me Off the Guest List is a multi-media presentation of the new book by Nick Zinner (of the Yeah Yeah Yeahs), Zachary Lipez, and Stacy Wakefield. A slideshow of Nick’s photos from the book is accompanied by ambient music played by Nick and Stacy while Zachary reads stories. Culture Club continues into Sunday as well. 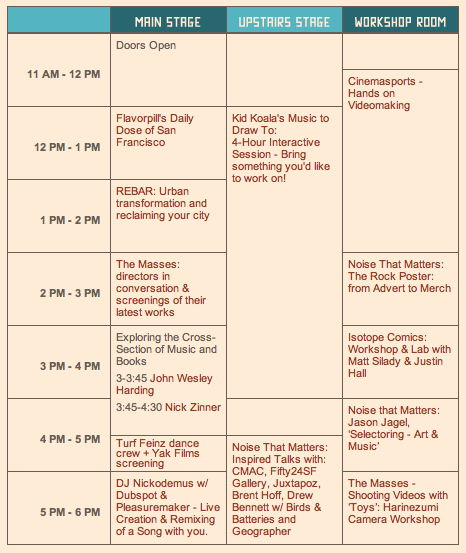 See here for the complete schedule and descriptions of every event. Author Allan HoughPosted on February 26, 2011 Categories Art, MusicLeave a comment on Reminder: Noise Pop Culture Club Starts Right Now! San Francisco’s oldest surviving building is Mission San Francisco de Asís. You know, that Mission on Dolores street that the Mission is named after? Yeah, that one. 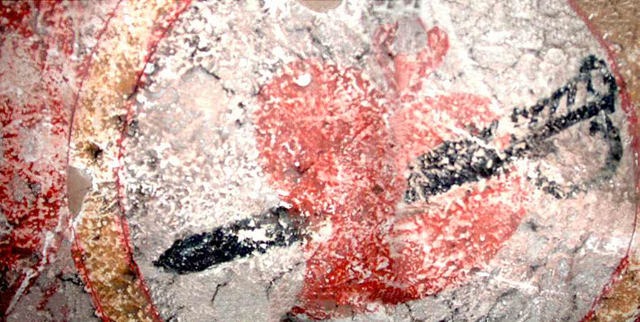 In 2004, a hidden mural was uncovered by Ben Wood and Eric Blind behind the building’s church altar. It was painted by Ohlone Indians under the enslavement supervision of Spanish missionaries in 1791. Ben Wood documented these findings and digitally captured the entire mural in this fascinating article at Found SF. 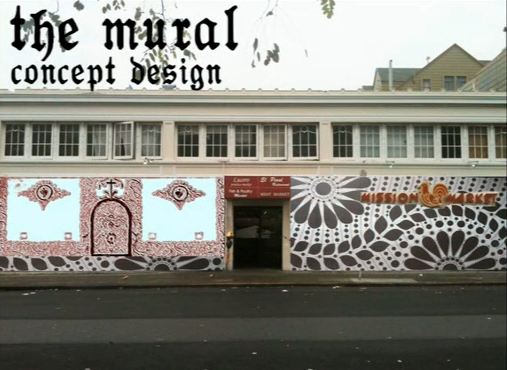 Now a kickstarter project has been created to resurrect the mural on the wall of Mission Market on 22nd and Bartlett. If funded, it will be painted by local artists Jet Martinez, Ezra Eismont, and Bunnie Reiss. Check out the kickstarter page for more details a great video on the subject. Wild stuff, right? Maybe it was all part of the art. 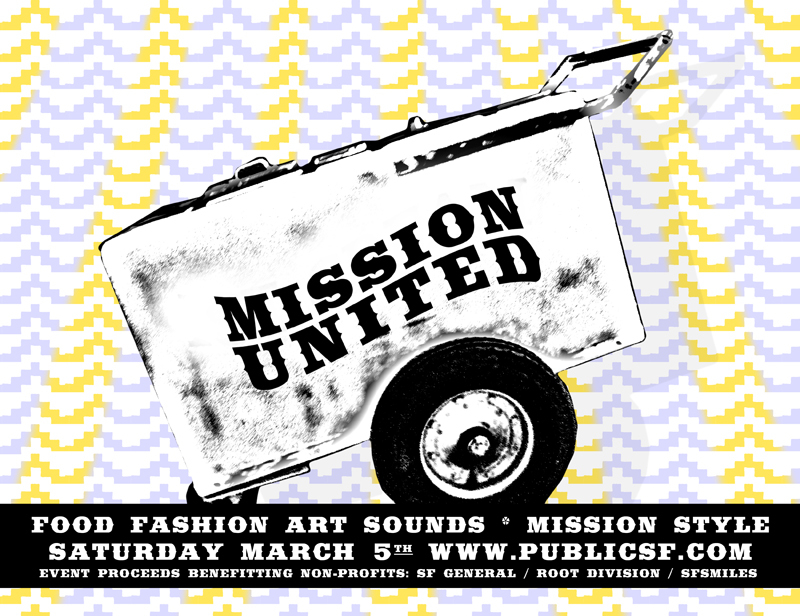 CONTEST: Win Tickets to Mission United! Check it out! 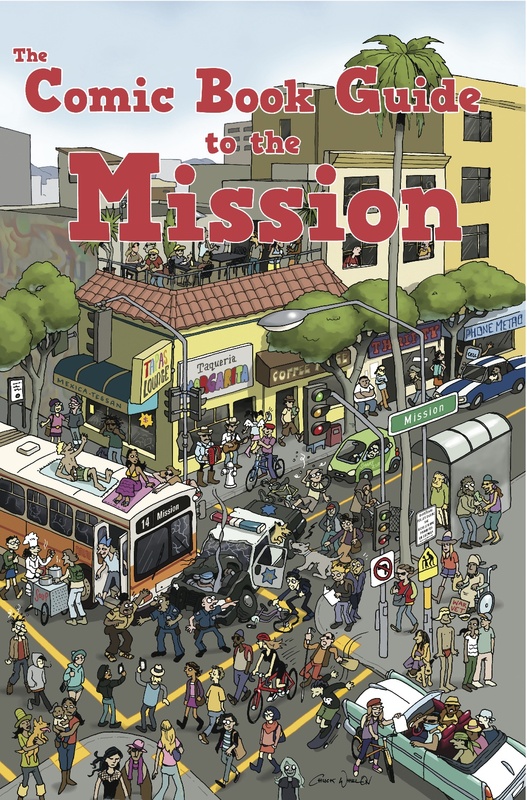 Public Works in a couple weeks is throwing a party devoted to the Mission. Several of your favorite DJs will be there (Yo, Primo! 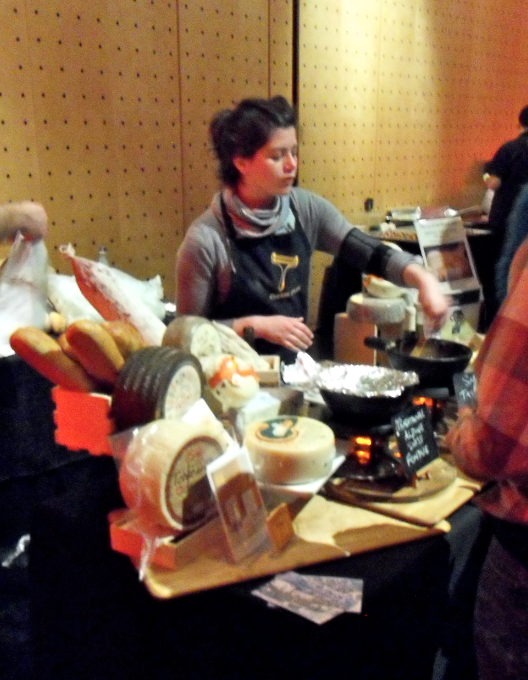 ), along with good food and drink, and a fashion show. And it’s eight hours long! “A party celebrating all things Mission”..
For $5 admission, FREE FOOD & DRINK SPECIALS (between 8pm and 10pm) click attending on this page! What’s more, we’re giving away free tickets. They say they’re celebrating “all things Mission,” so peruse the lineup and leave a comment below letting them know if they’ve forgotten anything key. The two best suggestions (as judged by us based on merit) will win a pair of tickets each. Contest ends Monday at 5pm. Author Allan HoughPosted on February 25, 2011 Categories Art, Food and Drink, Music4 Comments on CONTEST: Win Tickets to Mission United! No. I have nothing to say about it. I don’t collect anything. Sorry. What’s your favorite tool? Why? I like tape. 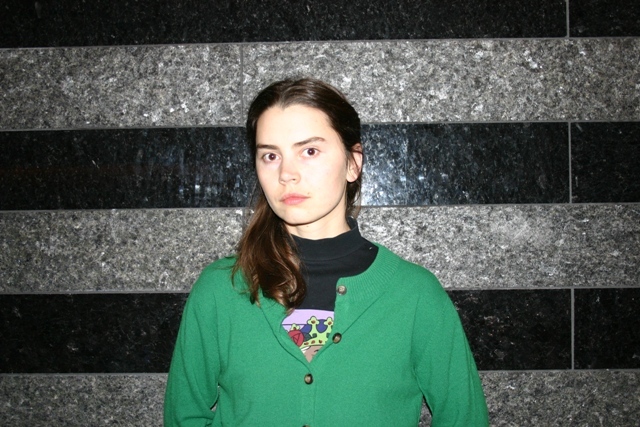 I very much like different kinds of tapes. I like glue, I like paper, and scissors. What should I be asking you? I’m Russian and when I go to another country, usually they ask me some questions about Russia and Russian politics and I’m surprised when it doesn’t happen this way. I would expect you to ask me this question. Read on. Do read on. Event info here. RSVP and invite your friends here. Through our special bartending investigative methods, we were able to contact the guilty party who had rented the room that Monday night. After a few days, the painting was returned via messenger. 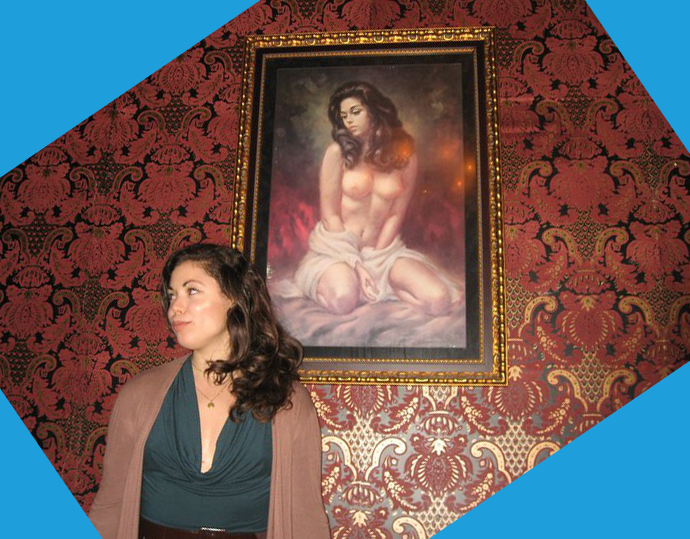 We’re happy to have her back and will be taking further methods to assure that all the naked ladies in the bar are permanently secured to the walls. The woman who stole it has been permanently 86’d. Hear that? Per the new policy, if you’re a lady and you plan on being naked at Homestead, you will be permanently secured to the wall. Keep your clothes on.